Bearded, spotted, ribbon, and ringed seals are key components of Arctic marine ecosystems and they are important subsistence resources for northern coastal Alaska Native communities. Although these seals are protected under the Marine Mammal Protection Act (MMPA) and bearded and ringed seals are listed as threatened under the Endangered Species Act (ESA), no reliable, comprehensive abundance estimates are available for any of the species. Obtaining reliable abundance estimates for ice-associated seals is vital for developing sound plans for management, conservation, and responses to potential environmental impacts of oil and gas activities and climate change. The Bering Okhotsk Seal Surveys (BOSS) project addressed the most critical need for fundamental assessment data on ice-associated seals (also known as ice seals) in the Bering and Okhotsk Seas. The abundances of these species are very poorly documented. Improved monitoring of ice seals is fundamental for the National Marine Fisheries Service (NMFS) to meet its management and regulatory mandates for stock assessments under the MMPA and extinction-risk assessments under the ESA. 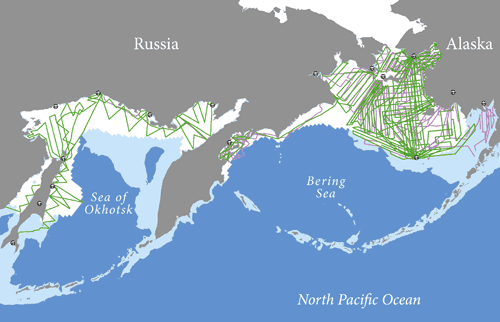 BOSS 2012 (pink) and 2013 (green) survey track lines in the Bering and Okhotsk seas covering over 90,000 km (56,000 miles) completed during the joint U.S.-Russian survey effort. The 500m isobath is in light blue and April 2013 ice extent is in white. The best way to estimate the abundances of ice-associated seals is to conduct aerial photographic and sightings surveys during the reproductive and molting period when the geographic structure of the population reflects the breeding structure and the greatest proportions of the populations are hauled out on the ice and are available to be seen. 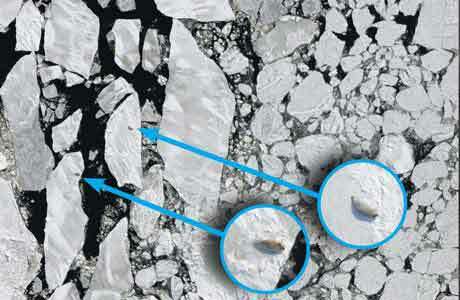 The distributions of these seals are broad and patchy, and so surveys must cover large areas. Similarly, the extent, locations, and conditions of the sea ice habitat change so rapidly that any surveys must be conducted in a relatively short period of time. The expense and logistic complexity of these surveys have been the primary impediments to acquisition of comprehensive and reliable estimates. Scientists at NOAA's National Marine Mammal Laboratory's (NMML) Polar Ecosystems Program (PEP) collaborated with colleagues from the State Research and Design Institute for Fishing Fleet ("Giprorybflot") in Saint Petersburg, Russia, to conduct synoptic aerial surveys of ice-associated seals in the Bering and Okhotsk Seas. Conducting spring-time surveys in those areas will yield abundance estimates for the entire population of ribbon seals, and all but a small fraction of the spotted seal population. For bearded seals, the surveys included the large and important fraction of the population that overwinters and breeds in the Bering and Okhotsk Seas. The U.S. Bureau of Ocean Energy Management provided critical financial support in 2012 and 2013 to complete the U.S. surveys of the central and eastern Bering Sea. Surveys for the portions of the bearded and ringed seal populations that breed in the Chukchi and Beaufort seas will require a separate and subsequent survey with different seasonal timing. Advanced thermal-imaging technology was used on both the U.S. and Russian survey aircraft to detect the warm bodies of seals against the background of the cold sea ice. Pictured above are two adult bearded seals detected with thermal imagery. Two years of survey effort were required to achieve adequate precision (CV= 0.1) for abundance estimates and to ensure that sufficient periods of suitable weather occurred during survey periods. Aerial surveys for bearded, spotted, ribbon, and ringed seals were conducted in spring 2012 and 2013. In the United States and Russia combined, the teams flew more than 47,000 nautical miles (nmi) (90,000 km) of survey track. The completion of this project marks the largest survey of ice-associated seals ever completed and will provide the first comprehensive estimates of abundance for bearded, spotted, ribbon, and ringed seals in the Bering Sea and Sea of Okhotsk.